Your Furniture’s Final Touch is Our First. At every single step of your creative process you have made sure to use great materials, design and a final quality that will WOW your customers. And you want to make sure they know how to find you when they fall in love with your furniture! But are you sure they know how? We want to make sure they do! How? A label on the back or the inside of your upholstered chairs will do just the trick. How is a furniture label different than any other one label? A label is a label, right? As long as they have the right information, you shouldn’t worry about it… Or should you? Well, a label is a label. But not every wrench works for every job! Let’s start with saying that there are many ways and places you could use a label, and the type of label that will be just right for your product will depend on … your product. So the right label for you upholstered chairs or couches will depend on the materials you are using, its design and the price point you are planning on selling them for. Woven damask labels are by far the most popular type of label our customers use for their custom-made furniture, with an adhesive backing to affix it the fabric. What is The Type of Label Mostly Used for Custom Upholstered Furniture? By far the most common type of label used by business owners – from startups to Large Sellers – Is the woven type, in specific the Damask Woven label. It’s quality and durability are great and there is vast amount of colors available to you. Woven labels will not fade or fray (unlike its contrapart, the printed label – especially printed cotton labels) and if you can order as little as 100 labels, you have a good way of branding your handmade bags for that craft show you are preparing to. As you can imagine, the ‘best size’ for your woven label will depend on the size of your furniture. 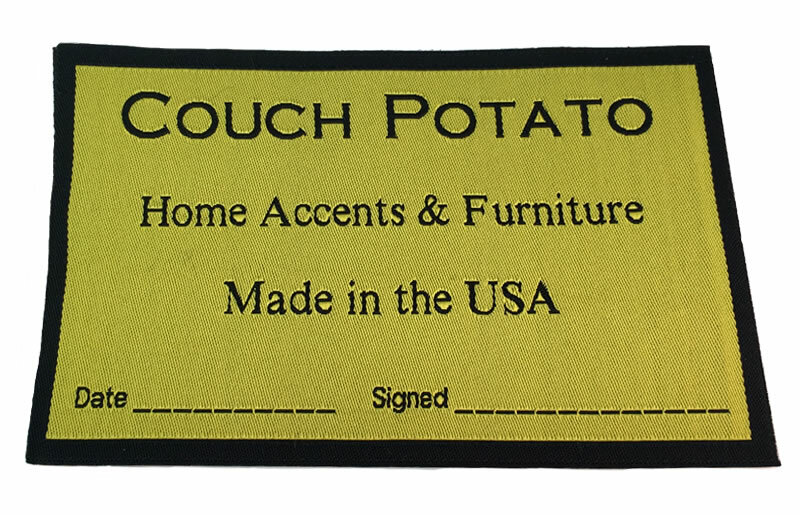 In all of the years we have being making labels for furniture, we have seen them in the rather larger size, 3″x5″ minimum up to a 5″x7″ for larger ones. With a label that size, you have plenty of room to have your brand name, a slogan or material, website, phone number, place of fabrication. Do you have a website, Etsy shop, Facebook, Twitter, Instagram, Pinterest Page? By all means add your main form of contact to the label, whichever it is.